That goods and truths are the genuine foods of man must be evident to every one, for he who is destitute of them has no life, but is dead. When a man is spiritually dead the foods with which his soul is fed are delights from evils and pleasantnesses from falsities--which are foods of death--and are also those which come from bodily, worldly, and natural things, which also have nothing of life in them. 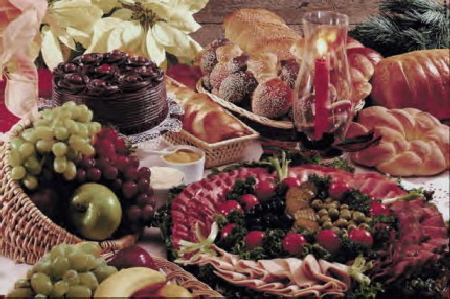 Moreover, such a man does not know what spiritual and celestial food is, insomuch that whenever food or bread is mentioned in the Word he supposes the food of the body to be meant; as in the Lord’s prayer, the words Give us our daily bread, he supposes to mean only sustenance for the body; and those who extend their ideas further say it includes also other necessaries of the body, such as clothing, property, and the like. They even sharply deny that any other food is meant; when yet they see plainly that the words preceding and following involve only celestial and spiritual things, and that the Lord‘s kingdom is spoken of; and besides, they might know that the Word of the Lord is celestial and spiritual. Jesus said, Labor not for the meat (or food) which perisheth, but for that meat which endureth unto eternal life, which the Son of man shall give unto you (John 6:27). Your fathers did eat manna in the wilderness, and are dead. This is the Bread which cometh down from heaven, that a man may eat thereof and not die. I am the living Bread which came down from heaven; if any man eat of this Bread he shall live eternally (John 6:49-51, 58). But at the present day there are men like those who heard these words and said: This is a hard saying; who can hear it? and who went back and walked no more with Him (John. 6:60, 66), to whom the Lord said: The words that I speak unto you they are spirit and they are life (John 6:63). Jesus said, Every one that drinketh of this water shall thirst again; but whosoever drinketh of the water that I shall give him shall never thirst; but the water that I shall give him shall become in him a fountain of water springing up unto eternal life (John 4:13, 14). But at the present day there are those who are like the woman with whom the Lord spoke at the well, and who answered, Lord, give me this water, that I thirst not, neither come hither to draw (John 4:15). The enemy hath spread out his hand upon all the desirable things of Jerusalem; for she hath seen that the nations are entered into her sanctuary, concerning whom Thou didst command that they should not enter into Thy congregation. All the people groan, they seek bread; they have given their desirable things for food to refresh the soul (Lam. 1:10, 11). These wait all upon Thee, that Thou mayest give them their food in its season; Thou givest them, they gather; Thou openest thine hand, they are satisfied with good (Ps.104:27, 28). Here likewise spiritual and celestial food is meant. A virgin shall conceive and bear a Son, and thou shalt call His name Immanuel; butter and honey shall He eat, that He may know to refuse the evil and choose the good; and it shall come to pass that for the abundance of milk that they shall give they shall eat butter; for butter and honey shall every one eat that is left in the midst of the land (Isaiah 7:14, 15, 22). Bring ye all the tithes into the treasure-house, that there may be food in My house (Malachi 3:10). Not that which enters the mouth renders a man unclean, but that which goes forth from the heart by the mouth renders a man unclean ( Mt 15:11, 17, 18, 19). And blessed him; yea, and he shall be blessed. That this signifies that it has been conjoined, is evident from the signification of being blessed, as being to be conjoined (n. 3504, 3514, 3530, 3565, 3584). How the case is with the appropriation and conjunction of the truth represented by Jacob may be seen from what has been said above. But as these subjects are of such a nature as to transcend the apprehension of the natural man, and cannot be seen except in the light in which is the rational or internal man, in which light at the present day there are but few, because few are being regenerated, therefore it is better to illustrate them no further, for the illustration of things unknown and transcending the apprehension does not bring them into light, but into more shade. Moreover such things are to be built upon ideas of natural truths, through which they are to be apprehended, and at the present day these also are wanting. This is the reason why the words just preceding have been explained so briefly, and merely as to the internal sense of the expressions.